Washington Cherry Season has Arrived! The Washington cherry season is finally here! Chelan Fresh cherries are beginning to land in stores just in time for the start of warm weather activities such as picnics, camping and boating. Our cherry farmers work year-round to ensure bountiful harvests. They nurture their trees throughout the winter and since March they have spent sleepless nights monitoring unpredictable spring weather to ensure that emerging cherry buds stay warm. Nightly monitoring of wind machines that help move the cold air ensures the spring nights do not cause damage to the emerging buds. Once the bloom happens, bees take over spreading pollen throughout the orchards to create tiny fruit that grows into a bountiful harvest with help from the warmer days of late spring. Our beautiful Dark Sweet cherries kick off the season with availability that grows steadily through late July and continued supplies into mid-August. Harvest for Rainier cherries generally begins about 7-10 days after the start of the Dark Sweet cherry season. They then try to steal the spotlight for a few short weeks with their unique color and ultra-sweet flavor. Not to be missed is our proprietary Orondo Ruby® variety that just might be Nature’s Perfect cherry with its unique blush color and sweet, complex flavor. Chelan Fresh cherries are here and ready to land on the shelves of your retail store. Contact your Chelan Fresh Sales team to put our quality fruit in your hands: 509-682-4252. Its official! Our Orondo Ruby® cherry harvest is less than two weeks away! Orondo Ruby® brings together the special qualities of both the Dark Sweet Cherry and the Rainier cherry into one blush colored and sweet but complex flavored package! 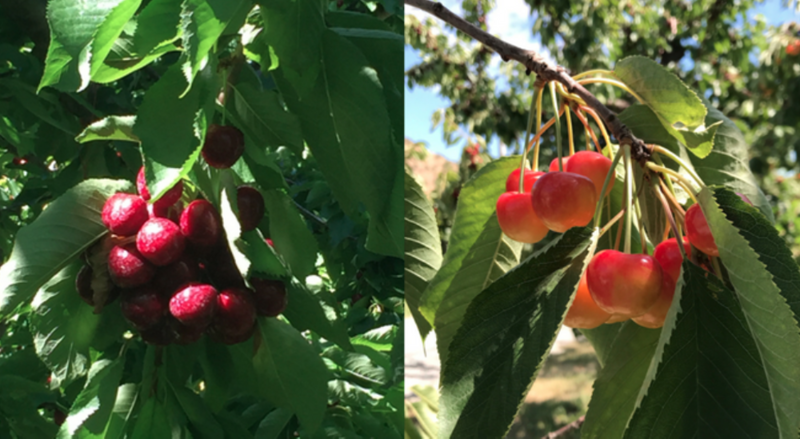 We at Chelan Fresh think it may be Nature’s Perfect Cherry! Call your Chelan Fresh sales team for more information about featuring this special cherry at your retail store: 509-682-4252. Our Chelan Fresh employees are by nature an active group of people; but one employee goes over and above in her fitness regime. Sharla Austin (pictured above right), Controller at Chelan Fresh, loves to run ½ marathons, full marathons and a 5K is a sprint for her. In April Sharla added another notch to her race belt as she and her sister Heather Fox (pictured above left), conquered the Boston Marathon and qualified for 2019. Growing up in the Tonasket Valley prepared them well for the crazy Boston weather they encountered on race day. Sideways rain, 20 mph headwinds and cold temperatures made for less than ideal race conditions, but the course was no match for Sharla and Heather. They both finished in just over 4 hours and were out on the Boston tourist trail the next day. Our hats are off to Sharla and her sister for all of their commitment to their sport! Favorite Apple: SugarBee®! It is crisp and sweet at the same time. Favorite Cherry: Orondo Ruby® – I like that it is sweet but has a firm texture as well. Favorite part of working at Chelan Fresh: The People. Chelan Fresh is an active supporter of local school programs and I am very proud of the mentorship program the Accounting department started 10 years ago. Chelan High School’s Mentorship program chooses students who are interested in a career in accounting, fruit sales or business studies and pairs us with a student to join our team for a semester or in most cases a year long placement that turns into full time summer employment. Our Accounting department provides training and encouragement for students to advance by attending college or participate in advanced training. In some cases, we take on the role of a second parent and help with scholarship applications, college applications, letters of recommendation and even motherly advice for life after high school. Many of the students have told us that if it weren’t for the mentor program and Chelan Fresh they would have never even thought of going to college. Chelan Fresh believes it takes a village and we are proud to be part of the village for our local students. Favorite thing to do outside of work: I love to run! I especially love the challenge of training for races. It forces me to focus and stick to my goals. I also enjoy baking and still bake regularly using fresh fruit and some of the recipes shared to me by my grandmother when we were growing up in Tonasket, WA. Many of the orchards in Chelan valley are a family affair, with women playing a critical role in running smooth operations and growing the business. In our blog series “Women in Agriculture” we sit down with them to discuss their roles and thoughts on the industry. This month we checked in with Megan Azzano. Megan and her husband Mike own and operate a family orchard and fruit stand in the Omak area. Visit us at an Industry Trade Show! Stop and say “Hi” next time you are at an industry Trade Show. Our Chelan Fresh staff loves to meet new people and connect with old friends.